Like most of us, babies love sleeping. The best you can do for your little one is to ensure they have the best place to rest. Choosing where your little one will sleep is one of the crucial decisions that you will have to make even before you welcome them. You also have to ensure that the place is not only safe but also comfortable enough given that your baby will spend the better part of their first few months in it. There are so many sleep-related deaths happening each year and every parent would want to avoid it and getting a great baby bassinet is one of the ways to keep your baby safe. The market is rich in baby bassinets and you can be sure that getting one will not be an issue. The hard time comes in when you want nothing but the best. Today we look at the best baby bassinets you should consider in 2018 to your selection easier. The bassinet’s mattress has to be thin and also hard. While we might want to go for softness and coziness when it comes to our baby, this should not be the case when it comes to a bassinet mattress. A hard mattress will keep your baby safe from suffocation. Bassinets are quite small. Given your baby will be tossing from side to side when sleeping, ensure you pick a bassinet with mesh sides to allow your baby to breathe in case they roll on the side. Also, a meshed wall allows air to flow into the bassinet keeping your baby cool all through hot seasons and allows you to watch over your little one. Nothing guarantees safety than having an eye on your baby at all times. You will need to pick a bassinet that is easy to carry around with you. Consider one with wheels to make it easy for you to move from place to place in the house. Babies need a lot of essentials such as toys to soothe them, diapers, clean clothes and much more. You do not want to start looking all over the house for their favorite toy when they start crying. Pick a bassinet that comes with a storage basket or mesh pockets to allow you to keep all you will need within an easy reach. A rocking bassinet is perfect when it comes to soothing your baby. If you want an extra hand when it comes to calming your baby, then pick one that rocks. Different bassinets offer varying levels of rocking, and some will offer more than one speed. Be sure to choose what works best for you. We are sure you will not want anything to come between your baby and sound sleep. A canopy offers shade from the excess light that could wake your little one. Some bassinets feature two canopies to keep away more than just light. Ensure you get the best out of your purchase by making the most out of the bassinet’s accessories. Consider features such as a toy bar to help you calm your baby and wheels to help you move your baby from one room to another hassle-free. One that includes sheets and a sleeping pad is also convenient. Why we like it: The BabyBjorn Cradle features gentle motions that soothe your baby. It comes with breathable mesh fabrics for your baby’s safety. 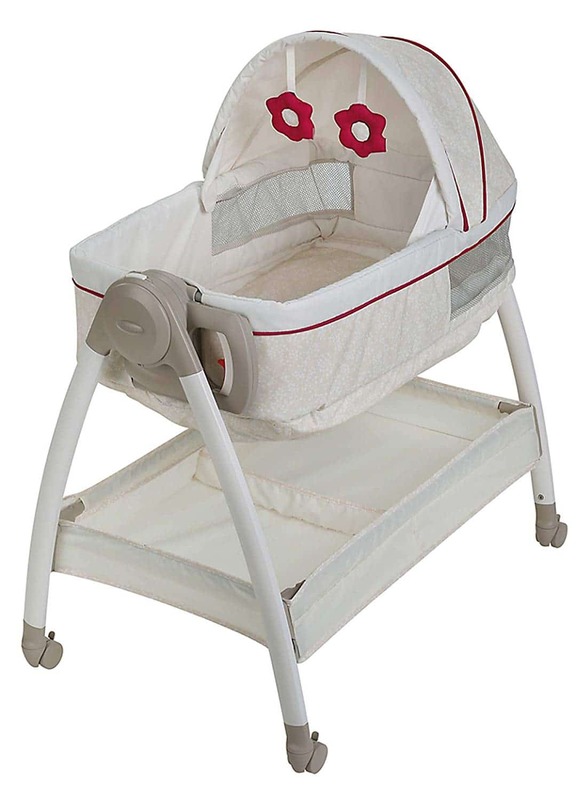 The fabric and the cradle’s low height also allows you to watch over your baby easily. It is made of wood and steel to guarantee a stable bassinet for newborns and is easy to move from place to place within the house. Light up your kid’s ride with the New Neon Flash kids scooter. The wheels light up when moving and its deck also has a reflective neon green light to ensure your kid is always seen wherever they go. It is human-powered so you will never have to worry about charging or replacing the batteries with this scooter. When it comes to your growing child, this scooter will hold them until they weigh 134 pounds. Its handlebars are also adjustable to fit your child at different heights. They will also like that it is lightweight (9.26 pounds) to facilitate transportation and storage. The Neon Flash kids scooter is motion-powered and will start easily as soon as your kid starts moving. It is strong and durable to grow with your child without worrying about replacing it. When it comes to safety, it features a safety brake at the back that stops the scooter immediately it is initiated. It also has a non-slip deck to ensure a firm grip when riding. It is also easy to handle to give your kid maximum control over the scooter for top-notch performance. The Neon Flash kids scooter does not come fully assembled but includes an assembly kit to make the work easier for you. It has 2 wheels made of Polyurethane making them durable and comfortable on the road. The wheels are also large for a smooth ride on uneven surfaces. The Neon Flash kids scooter is durable and has been built to grow with your child. The adjustable handlebar coupled with the strong frame designed to hold a maximum of 134 pounds makes this the best scooter for 5-year-old children and above. Why we like it: The Halo Swivel bassinet allows you to sleep with your baby side by side. Its height is adjustable to fit beds between 24 to 34 inches high. It rotates fully, and the sidewall bends and returns to allow you to reach out for your baby easily. Its base easily tucks beneath your bed to bring the baby close to you. We like the extra thick mattress thus assures your baby’s comfort all night. The bassinet features mesh walls that allow free flow of air into the bassinet to keep your baby comfortable even during hot seasons. It comes with a thick mattress to allow your baby to have a peaceful sleep all night long. The bassinet also has your comfort in mind. It allows you to tend to your baby without getting out of bed. The Halo Swivel bassinet safely tucks underneath your bed so you can easily watch over your baby. The mesh walls offer your baby maximum breathability to ensure they are safe when sleeping. The sidewall has a locking mechanism when you do not want it to lower down for your baby’s safety. Its sleeping pad secures to the bassinet perfectly to ensure your little one’s fingers are not stuck. Its edges are also smooth so you can be guaranteed of your baby’s safety always. 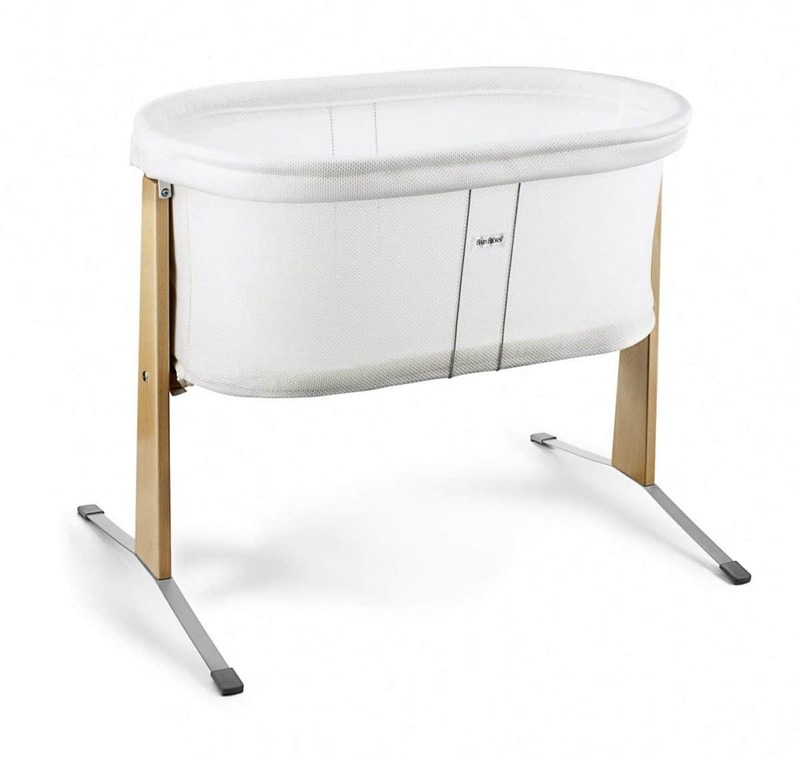 The Halo Swivel bassinet was designed with your convenience in mind. First, it features a four-point height adjustable mechanism to allow you to fit it in most beds of heights between 24 to 34 inches. You will like that it rotates fully in all directions to give you an easy time to bring your baby close to you as you wish when sleeping. The rotating mechanism also comes in handy when you want to get out of bed. The bassinet features sidewalls that you can pull down with ease when picking up your baby at night from the comfort of your bed. It comes with mesh pockets where you can keep your baby’s essentials such as toys. Putting it up is quite easy, so you don’t have to worry. 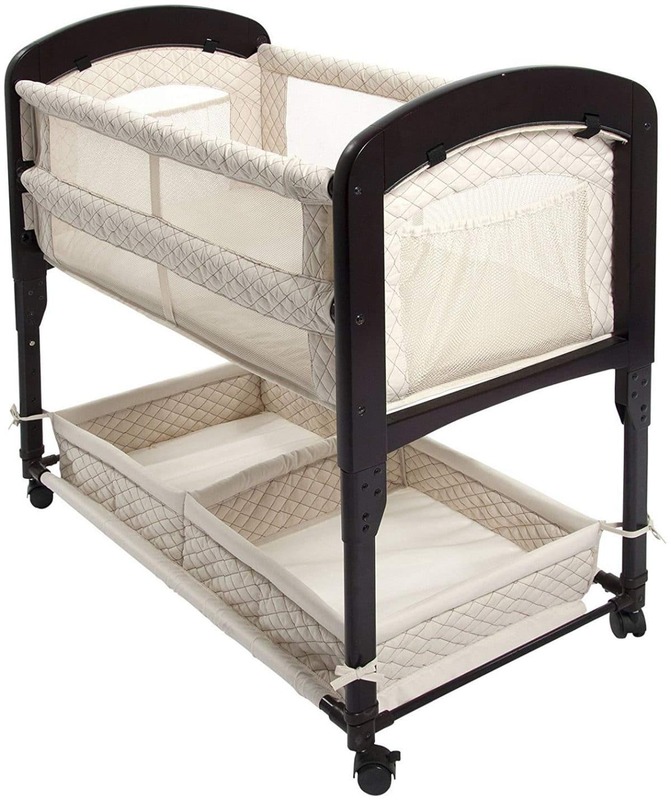 The bed and frame of this bassinet are spot clean thus easy to maintain a fresh look at all times. If you are looking for a bassinet that allows you to safely co-sleep with your little one, this could make an excellent choice. It slides beneath your bed and rotates 360 degrees so you can always have your baby as close as you want. It also comes with flexible sidewalls to allow you to pick up your baby from the comfort of your bed thus perfect for mothers who have undergone C-section or those who prefer limited movement. Why we like it: The Arm’s Reach Concepts co-sleeper bassinet comes with a storage basket under it where you can have your baby’s essentials. It is easy to assemble and is raised to allow your baby to sleep beside your bed. It features a stylish curved wood design at the end and has a breathable mesh for your baby’s safety. The Arm’s Reach co-sleeper bassinet was designed with breastfeeding mom’s comfort in mind. It attaches to your bed meaning your baby is always within your arm’s reach and you can always pick them up from the comfort of your bed. The mesh side will keep your baby cool when summer comes. 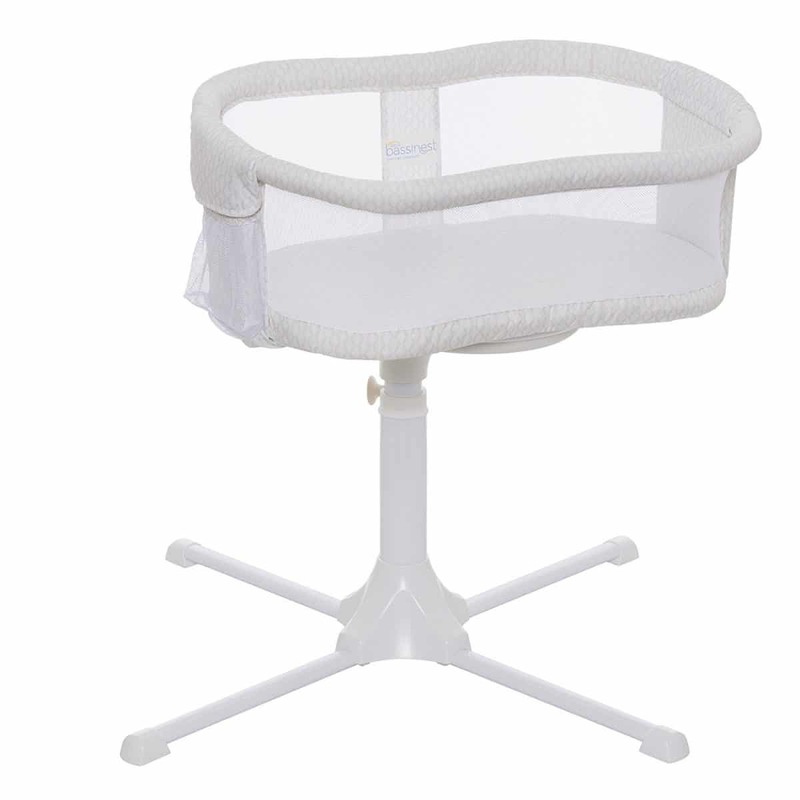 The bassinet comes with mesh walls to allow your child to breathe while sleeping. The raised design enables your baby to sleep beside you at night so you can safely check out on them throughout. It is made of wood to guarantee you sturdiness at all times. Its mattress has a tight fit and is firm so you won’t have to worry about your baby suffocating. The Arm’s Reach co-sleeper bassinet is raised to allow your baby to sleep beside you. This makes it easy for you to reach out for your baby when you need to at night. It is also convenient for you when placing your baby on the bassinet and when taking them up. It has storage under it where you can store all that you need when it comes to taking care of your little one. You will like that it is quick to assemble and your baby will have a safe place to rest in no time. Its beautiful design adds to your bedroom style. It features four wheels so you can easily move with your baby from room to room. The wheels lock when you don’t want the bassinet to move. It’s lining and sheets are machine washable to guarantee stress-free cleaning. If you are looking for a bassinet that will allow your baby of less than 5 months old to sleep next to you, this makes a great choice. Its sides can be let down to allow you to pick your child up easily. It is also perfect if you want a bassinet you can easily move around the house thanks to the included wheels. Why we like it: The Graco Dream Suite offers you a bassinet and a changing station all in one. It offers dual vibration speeds to soothe your baby to sleep. It comes with four wheels to allow you to move it from room to room within the house with ease. 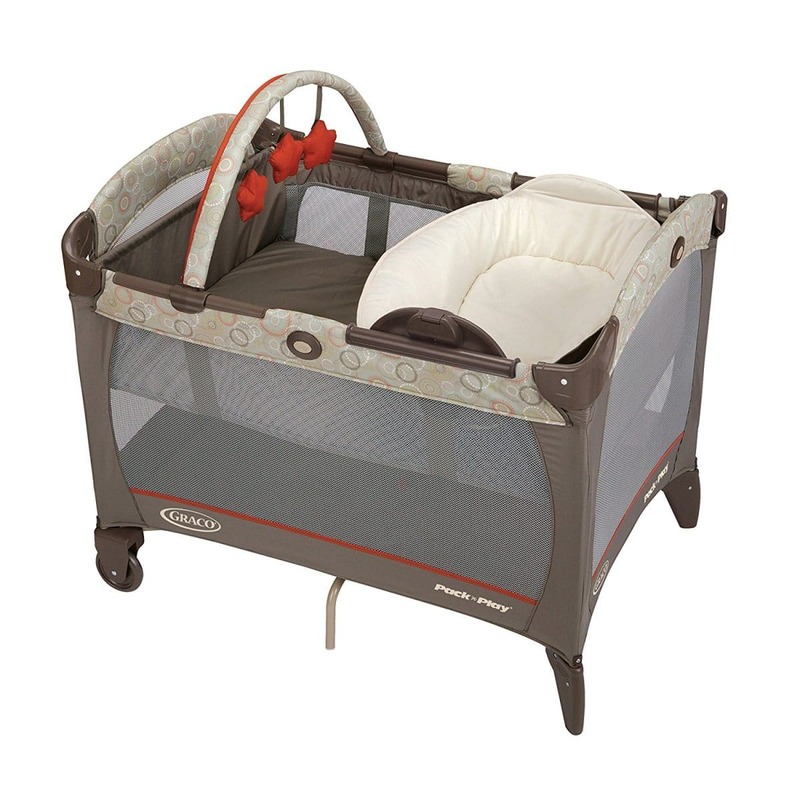 The wheels are lockable, and it also comes with a canopy to protect your baby from excess light. We like the included toys for your baby’s amusement. When it comes to soothing your baby, the Graco dream suite bassinet offers two vibrations so you can choose one that comfortably calms your baby. It also features a canopy that offers your baby shade from excess light when they are sleeping. Your baby will love the included toys that entertain them whenever they are in the bassinet. The side mesh keeps your baby from overheating thus comfortable for use in all seasons. The Graco Dream Suite bassinet features four wheels so you can always take your baby with you wherever you go for maximum safety. The wheels are also lockable to ensure sturdiness when you need it. The mesh sides let you to see your baby clearly and also keeps them from suffocating. The Graco Dream Suite bassinet allows you to change your baby’s diaper as well as put them to sleep all in one place. The changing section grows with your baby and allows you to use it until your baby is 30 pounds. It comes in different colors so you can pick one that compliments your home décor. It features a huge storage basket so you can have all you need within an easy reach. It is small in size, therefore, fits perfectly in your bedroom meaning your baby will always be close to you. Its mattress cover is detachable and can be machine washed so you won’t have to worry when it comes to cleaning it. If you are working on a budget and looking for a reliable bassinet for your 3 months old baby or younger, this could be your best pick. Although inexpensive, the bassinet comes with great features that both you and your baby will love. It comes with a mechanism that soothes your baby and offers you both a changing station and a bassinet thus great for the price. Why we like it: The Chicco LullaGo is easy to set up and comes with removable fabrics that are easy to wash. It features anti-slip feet and a mesh side for breathability and increased visibility. It is lightweight, quickly folds and comes with a carrying bag to facilitate transportation. The Chicco LullaGo bassinet comes with a large mattress that is well padded to keep your baby comfortable throughout the night. The mesh windows allow free circulation of air keeping your baby cool at all times. 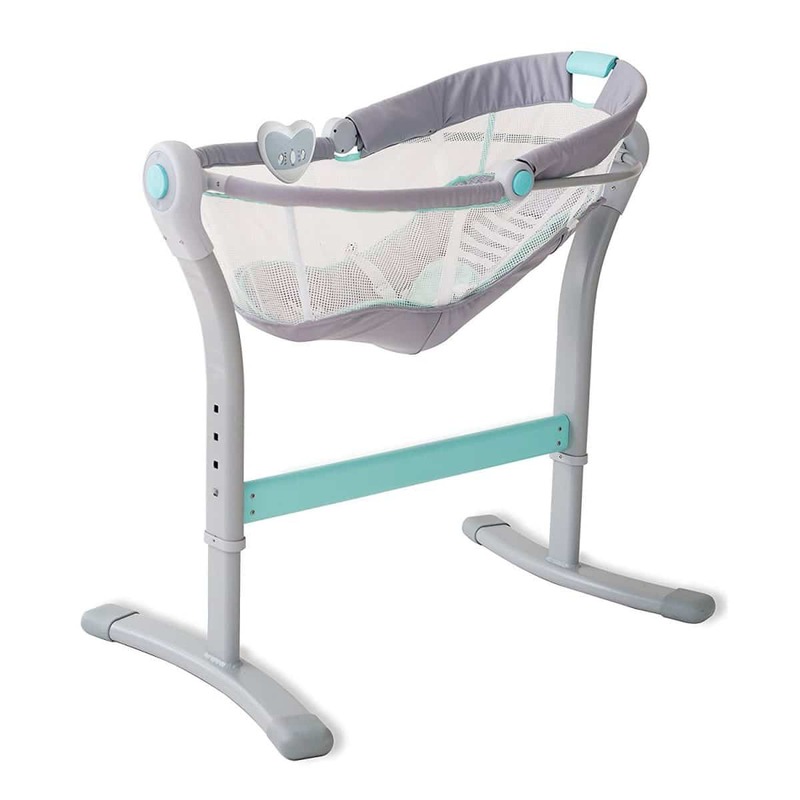 The bassinet features non-slip feet to ensure sturdiness for your baby’s safety. It is also stable and will comfortably support your baby’s weight. The mesh sides allow your child to breathe and also enable you to keep an eye on your little one to ensure they are safe at all times. 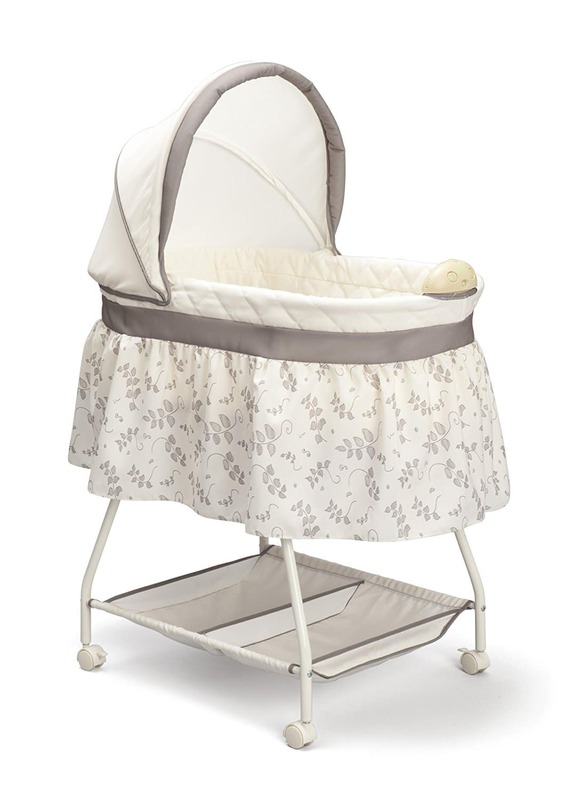 The Chicco LullaGo bassinet features snap-on legs to ensure an easy time setting up. All its fabric are easy to remove and can be machine washed to guarantee an easy time cleaning. The bassinet will stay with you for a long time as it allows you to use it from birth until when your child weighs 20 pounds. It folds easily and comes with a carrying case thus perfect for travel. It is also lightweight therefore easy to move from one place to another. If you are looking for a bassinet that is easy to assemble and take down to facilitate your traveling, this will make a good choice. It is also lightweight and comes with a carrying case to facilitate its transportation. The easy to wash fabric guarantees an easy time cleaning to guarantee a fresh bassinet at all times. Why we like it: The Graco Pack ‘N Play Playard offers you the option of switching it from a diaper changing station to a place for your little one to sleep. It is designed to grow with your child from the time they are born to their toddler years. It comes with storage pockets for your convenience, and it easily folds at the push of a button for storage and transportation. With Graco Pack ‘N Play, your baby gets a generous space to play once they grow up. The toy bar comes with little toys that soothe your baby when in the bassinet. It has a sturdy construction to support your baby comfortably. The play yard features see-through sides to allow your baby to breathe and also to enable you to watch your baby to ensure they are safe at all times. It comes with four wheels so you can take it with you from place to place to keep an eye on your baby wherever you are. The Graco Pack ‘N Play Playard allows you to easily switch from a sleeping place to a place to change your baby within seconds. The changing station comes with wipe-clean fabrics to guarantee you an easy time cleaning. It gives you a bassinet when your baby is less than 3 months and allows you to switch to a playpen once they grow up. It features storage pockets to allow you to keep all that you need when taking care of your baby within an easy reach. When it comes to storage and transportation, you can easily fold the play yard with a simple button push. It comes with a machine washable carrying bag to facilitate transportation. The sleek design will be a perfect addition to your nursery or bedroom. If you are looking for a bassinet and a play yard all in one, consider this play yard from Graco. The playpen is spacious thus perfect if you want something that will grow with your child. It is also portable thus perfect for travel when you want your baby to have a familiar place to sleep and play when out of your home. Why we like it: The SwaddleMe by your bed sleeper allows you to have your baby close to you the entire night. 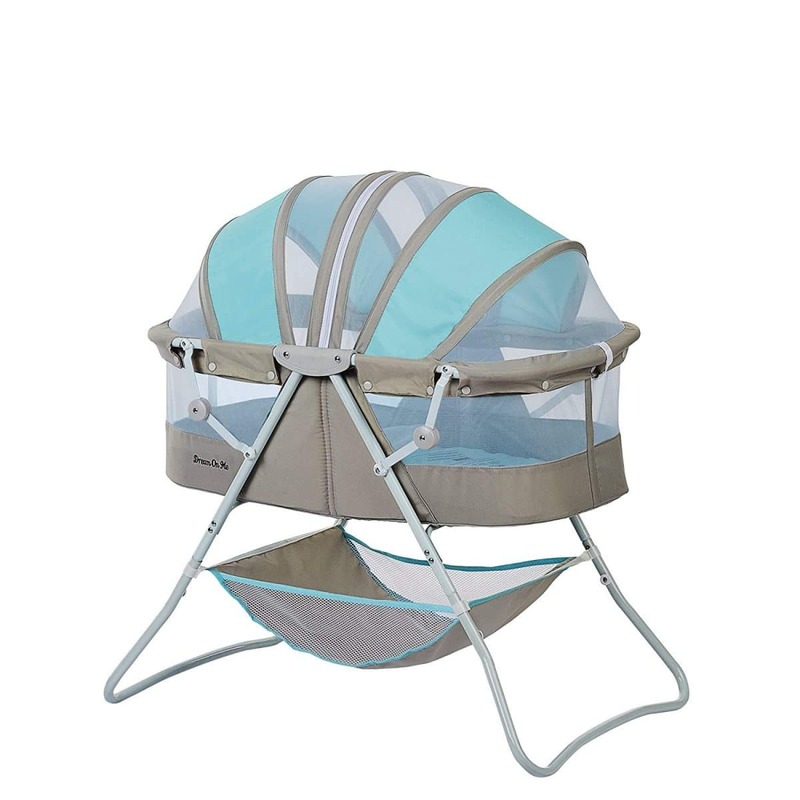 It features two positions to incline your baby thus perfect for baby with reflux. It offers side by side rocking that allows you to lull your baby from the comfort of your bed. We like the nightlight, sounds and 2-speed vibration for maximum soothing. The bedside sleeper from SwaddleMe features an adjustable height that allows you to sleep beside your baby at a comfortable level. You can easily reach out to them without leaving the bed and the bassinet also allows you to rock it to soothe your baby. You can be sure of your baby’s comfort while sleeping thanks to the adjustable incline that cradles your baby’s head at 10 and 30 degrees. The side mesh prevents your baby from overheating. Its fabrics are soft to ensure comfort at all times. The SwaddleMe bedside sleeper cradles your baby’s head enhancing breathing and is also safe for babies with reflux. The sides feature a breathable mesh for your child’s safety. The see-through sides also enable you to watch over your baby with ease. Soothing your baby has never been this easy. The bassinet includes a dual speed vibration, a soft nightlight and lullabies all aimed at calming your baby. The base tucks under your bed bringing your baby close to you without taking up much space. The bassinet grows with your child by allowing you to lower its incline when your baby grows up. The infant insert is machine washable thus easy to clean. 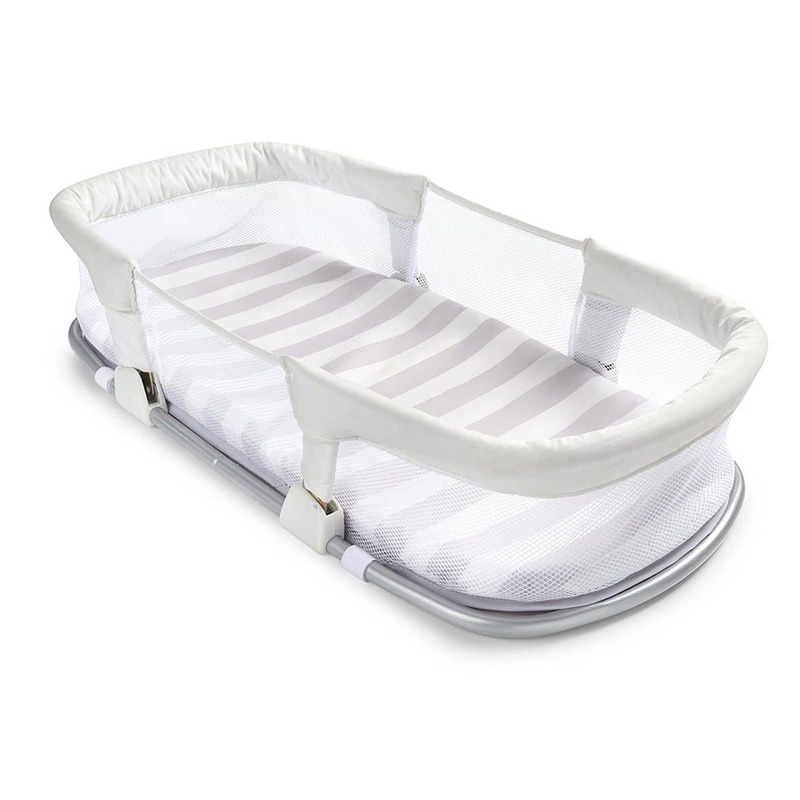 This incline bassinet is perfect if you are looking for a safe sleeping place for baby with reflux. It allows you to incline it at 10 and 30 degrees to comfortably hold their head up. It features multiple soothing mechanisms thus perfect for newborns. It offers you more than what traditional bassinets provide at an affordable price. Why we like it: The Dream On Me Karley bassinet comes with two canopies and sleeping pads. It folds quickly to facilitate storage and transportation. It has a storage compartment beneath it where you can keep your baby’s essentials. It offers a comfortable sleeping area and allows smooth rocking to ensure your baby sleeps peacefully. The Dream on Me bassinet features two adjustable canopies to fully cover your little one from light and insects for a comfortable sleep. It also offers a soft sleeping area and allows gentle motions that calm your baby. The breathable sides ensure your baby is cool even in hot weather. The see-through sides allow you to watch over your baby with ease and also ensures free flow of air into the bassinet to let your baby breathe. It is strong and can hold a baby of up to 25 pounds without breaking meaning you can safely use it for big baby. The bassinet folds quickly and is lightweight thus perfect for travel. The light frame also allows you to move with your baby from room to room. The included storage basket allows you to keep all that you need to soothe your baby within an arm’s reach. It comes in about eight colors so you can be sure to get one that fits your home design. You will also love that it is easy to set up. It does not take up much space thus perfect to fit in any place in the house. If you are looking for a bassinet that takes up little space for your newborn, this could make an excellent selection. It also comes with two canopies thus offers full coverage making it perfect if your house has pets or insects that can disturb your little one while sleeping. It is lightweight and easy to fold which makes it great for travel. Why we like it: The Delta Children sweet beginnings bassinet comes with an adjustable canopy to protect your little one from excess light when sleeping. It offers a comfortable place for your baby to rest and is sturdy enough to support your baby’s weight. We like the storage basket at the bottom that keeps all your baby’s essentials within an easy reach. The Delta Children sweet beginnings bassinet comes with a canopy to keep your child from excess light to ensure a comfortable sleep. You can move the canopy either upwards or downwards as you prefer. The polyester pad offers your child a stable and firm place to sleep for comfort. Your baby will love the preloaded lullabies that will soothe them to sleep. It features mesh panels that allow free flow of air thus keeping your baby cool in hot weather. The wheels of this bassinet are lockable to ensure sturdiness. It comes with two mesh panels to allow air to flow into the bassinet to allow your child to breathe. The Delta Children Sweet beginnings come with a storage basket with two sections to keep your baby’s essentials. It has four wheels so you can move with your baby from one room to another hassle-free. It features a nightlight for your convenience when you want your baby to sleep. The nightlight and sound features are easy to put on and off with a simple button push. Its height allows you to fit it by your bedside for easy access to your baby in the middle of the night. It also takes up a small area thus perfect for rooms with small spaces. Although it comes with a lot of pieces to attach, it will take you just about 30 minutes to set up. When it comes to cleaning, you can easily spot clean the fabric. The Delta Children Sweet beginnings will make an excellent choice if you are looking for a bassinet for your newborn. The easy to initiate lullabies and the soothing nightlight is perfect when you want to put your baby to sleep. It is lightweight to facilitate moving from one room to another but still sturdy enough to hold your baby until they weigh 15 pounds. Why we like it: The SwaddleMe side sleeper is made of polyester to ensure a durable sleeping place for your baby. Its fabric is soft for your baby’s comfort. It comes with mesh sides to allow free flow of air and maximum visibility. It folds flat for easy storage and to facilitate transportation. The SwaddleMe side sleeper comes with soft fabrics that keep your baby warm and comfortable as they sleep. Its mesh sides allow free flow of air to avoid overheating so you can be sure of your baby’s comfort even when summer comes. Its mattress pad is comfortable to add to your baby’s coziness. The mesh panels not only allow your baby to breathe but also let you watch over your little one to ensure they are always safe. It also offers a safe way to co-sleep in bed with your baby. It features a strong metal frame that ensures you do not roll over your baby when sleeping. The SwaddleMe side sleeper will give you an easy time when traveling. It folds fully to a compact size that easily fits in your luggage. It is lightweight so you won’t have to worry about carrying it with you. It also allows your baby to sleep by your side, therefore, you can easily reach out to them from the comfort of your bed. Its wall is compressible so picking up your baby is hassle-free. You will love that the side sleeper comes with a removable mattress for easy cleaning. If you are looking for a bassinet that will allow you to co-sleep in-bed with your baby of less than 3 months, then this would be an excellent choice. It features a strong metal frame to prevent you from rolling over it and has flexible sides so you can easily reach out for your baby when you want to tend to them. It is lightweight and foldable thus perfect for traveling. This type of bassinet is designed to allow you to sleep with your baby as close to you as possible. It tucks under your bed mostly to ensure it takes up a small space and also brings the baby closer. If you buy this bassinet, consider one with an adjustable stand to allow you to bring your baby at an eye level. This bassinet is one that allows you to place it on its own in your room. You could place it beside your bed, but they are bigger compared to co-sleepers and takes up a lot of space. Its sidewalls are often high and you will need to get out of bed to tend to your baby. Most come with wheels for easy moving from one room to another. This gives you more than one function all in one. It is convenient as it offers you more than one benefit. They could come with a bassinet and a playpen that allows your baby to continue using it after they outgrow the bassinet or a bassinet with a travel crib. Some also offer you a place to change your baby’s diapers. Bassinets are not universal, so you will have to consider your baby’s weight before selecting one. Manufacturers often give maximum and minimum weight limits that you should observe for maximum safety. Also, consider your baby’s age. You may have it right when it comes to weight, but your baby’s age does not cut it. Check the manufacturer’s recommendation for both. The area you intend to place the bassinet determines a lot of things. First, this is what will determine the size of the bassinet. If you are considering placing it in the nursery, then a large-sized bassinet is okay. If you plan on having it by your bedside, consider one that is small in size. If your bedroom is big, you can opt for a large bassinet, but it will be hard to have it by the bed unless its base slips under your bed. Another option is an in-bed bassinet which allows you to co-sleep with your child. If this is what you want, ensure the frames are strong to keep you from rolling over your baby for safety reasons. Note that it is recommended that parents sleep with their kids in the same room. Is your baby tall enough to climb over the bassinet? Once your baby can stand and starts moving, you should consider transitioning to a play yard. Some bassinets are multipurpose and offer both bassinet and a playpen all in one and will grow with your child for convenience. If the main purpose of getting the bassinet is to offer your baby a place to sleep and rest while at home, consider one with wheels to allow you to move it from room to room within the house with ease. If they do not have wheels, you may want to consider a lightweight one that you can easily carry around without having to fold it. Babies are quite messy and you will need a bassinet with an easy to remove mattress for easy cleaning in case of a blowout. Machine washable sheets and mattress pad will also make it easier for you. Can you assemble the bassinet by yourself? Consider one that easily sets up without compromising on its sturdiness. Lastly, how much are you willing to spend on the bassinet? With multiple designs and styles in the market, getting a quality bassinet that fits your budget should not be tasking. Do proper research of what you want against your budget if you want to have an easy time picking the bassinet. Taking care of a baby involves ensuring they have a safe and comfortable sleep every night. Whichever way you choose to let them rest, always ensure it is safe. We have looked at the ten best baby bassinets in 2018 to make the work more manageable for you. Whether you are looking for a bassinet for travel or home use, for big baby or newborn, we have picked the best in each category.